The greater occipital nerve is the largest purely afferent nerve in the body and arises from the C2 dorsal ramus with variable assistance from the C1, C3, and C4 nerve roots. They distribute supply of the occipital scalp and are elongations of the cervical dorsal roots that also innervate the zygapophyseal joints of the high cervical spine. From fibers of the dorsal primary ramus of the second cervical nerve. To a lesser degree by the fibers of the third cervical nerve. The greater occipital nerve perforates the fascia a bit underneath the superior nuchal ridge along with the occipital artery. It rises upwards after emerging from below the suboccipital triangle beneath the obliquus capitis inferior muscle. It passes through the trapezius muscle and ascends afterwards in order to supply the skin along the posterior part of the scalp towards the vertex. Over the ear as well as over the parotid glands it innervates the scalp at the top of the head. 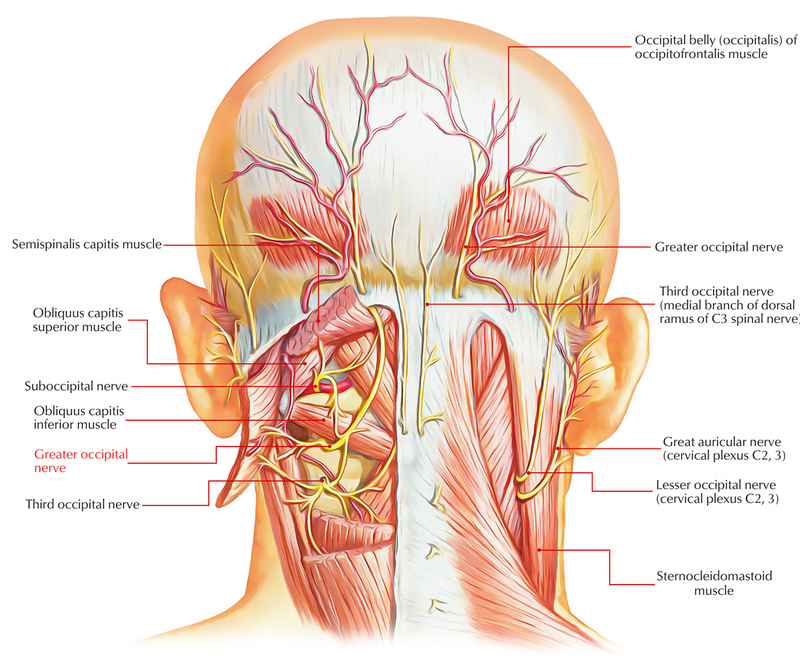 The scalp at the top of the head, over the ear and over the parotid glands is supplied by the great occipital nerve. By decreasing pain afferents to the cervical trigeminal nucleus caudalis, anesthetic blockade is said to have its therapeutic effect. The reaction towards occipital nerve block doesn’t shows that the occipital nerve itself is the cause of headache. Occipital nerve block provides clinical advantage via secondary cervical cord along with brainstem modulation of headache. Also, occipital nerve block procedures have reduced trigeminal autonomic features found within the nasal structures. For several different headache types, including migraine, cluster headache, and occipital neuralgia, the occipital nerve blockade may be utilized. Associated features of cervicogenic headache, including cervical range of motion, neck pain, and dizziness, have been shown to improve following occipital nerve block procedures.